Now that the first “snowstorm” has come and gone, some Massachusetts homeowners are discovering the unpleasant surprise that is water damage to their home. Discovering water damage often releases feelings of panic, anxiety and worry for homeowners, as they come to grips with the urgency and dangers of the situation. Dealing with water damage requires patience and know-how – better yet, an action plan that can be implemented in an emergency situation. Some of the minimum components of an effective water damage action plan are discussed below. Inevitably, if you store belongings in your basement or area affected by water damage, you’ll probably encounter some ruined items. For your belongings that are salvageable, however, it’s wise to have a relocation room or area to bring the damaged items. When deciding upon a relocation area for your damaged goods, consider that the longer your items sit in water, the greater the potential damage. Thus, pick a room or area that is close by to mitigate the damage. 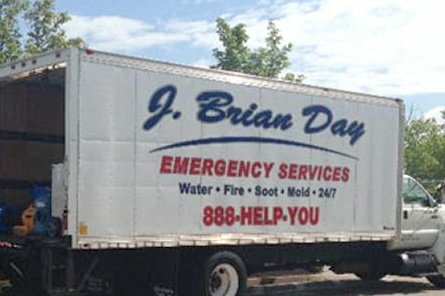 Since J. Brian Day conveniently offers direct insurance billing, it’s a good idea to take this opportunity to make sure your homeowners insurance is up-to-date. Call your insurance provider and make sure that your account is in overall good standing, and also ensure that there is nothing regarding your account that could potentially delay the billing process. Such a call takes only minutes out of your day and can save you a lot of stress and frustration down the road. Have us on speed dial! Somewhat of a joke, but in all seriousness, be sure to have our water damage number – 888-435-7968 – saved in your contact list. While it’s easy to find the number on our water damage page, having the number saved on your phone can save you a few potentially important minutes. Now that you have an action plan in place, you can feel ready to deal with a water damage emergency.